A modern computer has several CPU's or several cores within one CPU. The ability to leverage these multi-cores can be the key for a successful high-volume application. Processes and Threads In concurrent programming, there are two basic units of execution: processes and threads. In the Java programming language, concurrent programming is mostly concerned with threads. However, processes are also important. A process has a self-contained execution environment. A process generally has a complete, private set of basic run-time resources; in particular, each process has its own memory space. Processes are often seen as synonymous with programs or applications. However, what the user sees as a single application may in fact be a set of cooperating processes. To facilitate communication between processes, most operating systems support Inter Process Communication (IPC) resources, such as pipes and sockets. IPC is used not just for communication between processes on the same system, but processes on different systems. Every java application has at least one thread – main thread. Although there are so many other threads running in background like memory management, system management, signal processing etc. But from application point of view – main is the first thread and we can create multiple threads from it. Multithreading refers to two or more threads executing concurrently in a single program. A computer single core processor can execute only one thread at a time and time slicing is the OS feature to share processor time between different processes and threads. PerformanceThreads improve the performance (throughput, computational speed, responsiveness, or some combination of these) of a program. Shared Resources An advantage of using multiple threads over using separate processes is that the former share a single address space, all open files, and other resources. Potential Simplicity Multiple threads can reduce the complexity of some applications that are inherently suited for threads. Java provides two ways to create a thread programmatically. One way to create a thread in java is to implement the Runnable Interface and then instantiate an object of the class. We need to override the run() method into our class which is the only method that needs to be implemented. The run() method contains the logic of the thread. A class implements the Runnable interface, providing the run() method that will be executed by the thread. An object of this class is a Runnable object. An object of Thread class is created by passing a Runnable object as argument to the Thread constructor. The Thread object now has a Runnable object that implements the run() method. The start() method is invoked on the Thread object created in the previous step. The start() method returns immediately after a thread has been spawned. The thread ends when the run() method ends, either by normal completion or by throwing an uncaught exception. 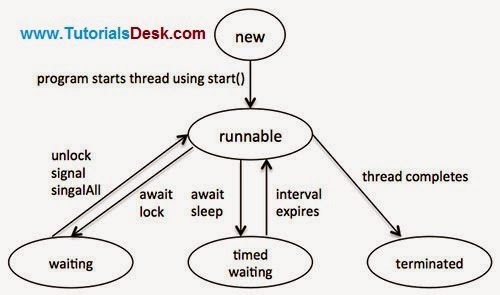 Below is a program that illustrates instantiation and running of threads using the runnable interface instead of extending the Thread class. To start the thread you need to invoke the start() method on your object. A class extending the Thread class overrides the run() method from the Thread class to define the code executed by the thread. This subclass may call a Thread constructor explicitly in its constructors to initialize the thread, using the super() call. The start() method inherited from the Thread class is invoked on the object of the class to make the thread eligible for running. Below is a program that illustrates instantiation and running of threads by extending the Thread class instead of implementing the Runnable interface. To start the thread you need to invoke the start() method on your object. Once we start any thread, it’s execution depends on the OS implementation of time slicing and we can’t control their execution. However we can set threads priority but even then it doesn’t guarantee that higher priority thread will be executed first. Run the above programs multiple times and you will see that there is no pattern of threads start and end. Difference between implementing Runnable and extending Thread? Hope we are able to explain you Java Multi Threading, if you have any questions or suggestions please write to us using contact us form. (Second Menu from top left).